Bear Creek Lake Community is conveniently located just off Rte 903 in Penn Forest Township, close to exit 74 off of The Northeast Extension of the PA Turnpike. The community is a secluded and private lake community with great amenities including a 137 Acre Lake, Beach, Outdoor Pool, Tennis Courts, Clubhouse and Road Maintenance. Click to View All Homes for Sale in Bear Creek Lake Community! The Magical Pocono Forest - Camelot Forest Conservation Community That Is! Up the northeast extension of the Pa Turnpike exit 95 or not too far off of Interstate 80 exit 284 sits the little town of Blakeslee, PA. Anchored by a few markets, stores and even restaurants and pubs and tucked away just minutes from Jack Frost Ski Resort and Jack Frost National Golf Course, this quaint little town consists of a few Pocono "Lake Communities". One such community here is Camelot Forest Conservation Community located right off of Rte 940. A conservation community is dedicated to the protection and preservation of their natural resources including their own on going eco-systems and the consistent upkeep of the natural landscape of the area. Camelot Forest is a smaller low key community with two lakes, a 14 acre and a 12 acre lake, one clubhouse and tennis courts. The community is served by public sewers and the roads are maintained by the local township but once inside you are lost in its beauty. Tall Trees abound around every corner with properties averaging .75 to 1 full acre in size. With it's close proximity to Jack Frost, Split Rock and Big Boulder (approx. 3 miles) , Camelot Forest has become a more popular destination for those Pocono Home buyers seeking lower dues and a more low key atmosphere with great location to everything. At Pocono Mountain Lakes Realty, one of our real estate professionals lives in this wonderful community and even serves on the communities board. For the most accurate and professional assistance in finding that perfect Pocono Home inside of this wonderful conservation community please feel free to call us and we'll take care of the rest. Ask for Doreen St Cyr when you call! To get you started on your search the right way feel free to Click Here to View ALL Homes Currently on the Market in Camelot Forest! An Informational Blog or a bunch of listing posts - Which Would you Prefer? 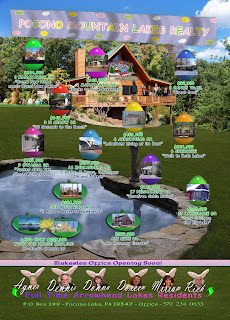 In the town of Pocono Lake this site actually ranks Realtors according to how many Blogs they post. My question is "Would you, the reader want to read relevant information about your community or see what listings a real estate agent has sold recently or even what they have for sale currently?" Seems to me that since You Can Always See EVERYTHING that is Currently on the Market in Arrowhead Lakes Just By Clicking Here, that you would like much more than that. Since Active Rain's ranking statistics don't differentiate from the art of a skillful blog and the art of 'copy and pasting', there will always be a ranking system that is deceiving to the Active Rain Consumer. In other words, being ranked #1 on Active Rain doesn't necessarily mean you are the top Blogger just that you are really great at 'copying and pasting' your listing activity to a Blog Spot and receiving credit for 10 second of work rather than a thoughtful and honest Bloggy Doooo! I mean to be quite honest if it is Pocono Mountain Listings you are looking for you can even see ALL LAKEFRONT HOMES FOR SALE and even still ALL GAMELAND PROPERTIES FOR SALE simply by clicking the appropriate highlighted links! The beautiful wooded Lake Community of Towamensing Trails is conveniently located just off Rte 903 in Albrightsville, PA. Close to Big Boulder Ski Resort and White Water Rafting, this community of many amenities sits nestled amongst the many Grey Birches of this area. Tucked away nicely among the mountains of Northeast PA is this Lake Towamensing with it's 190 Acres of Refreshing Beauty. This community also offers homeowners swimming pools, tennis courts and basketball courts, not to mention a fully functional Clubhouse / Restaurant setup like no other. For more information on this wonderful wooded community tucked away in the Fabulous Pocono Mountains and to view ALL Homes currently on the market in Towamensing Trails please click the following link! Enjoy!! Click Here To View ALL Homes Currently on the Market in Towamensing Trails! Ok Arrowhead Residents and Homeowners and potential future homeowners, this morning (Monday April 6) was the second monday in a row I found my self retrieving my trash can and cleaning up a mess of garbage strewn all over the place. I thought it must be a bear at first then my mind turned to the devious raccoons that I have battled wits with in the past and with the help a few COLD buckets of water was victorious in getting those sly garbage junkies to retreat in a wet panic and hadn't returned since. As I drove down the road to take Molly to the bus stop though I noticed one of the Very Big and Very Heavy Wooden Trash bins that hold the trash cans for most of the part timers was completely turned over and his trash spewed about in much the same manner as my own. This is the second week in a row for both of us. I guess I didn't want to believe that a bear was so close but in reality I think that is what it was. It wouldn't have been the first time I have seen a bear in our direct Vicinity on North Arrow so close to the lake as my neighbor Anita had one peeping through her slider back to Autumn's ago. I guess to confirm my suspicions I will have to camp out downstairs next Sunday night as Mr Bear approaches for Easter Dinner at the Cordisco Garbage Cans. Not sure what I will do but one thing for sure is I will get a picture for the followup to this blog. I am thinking we have to name him also. If anyone can think of a good "Bear Name" for a garbage rummager please pass it along to me. Till next time let me just say, keep your trash lids snapped tightly and if you live on North Arrow Drive keep me posted if you see him. All you interested folks who would love to be closer to nature, I have almost 90 properties of all shapes and sizes available in Arrowhead Lakes Community. Whether it be a lakefront home you are looking for or a property that borders PA Gamelands or just a simple getaway, fully functional cabin with fireplace etc... for under $100,000 I have the inventory for you. Pay us a visit on any of our sites to view ALL Pocono Mountain Homes for Sale! So You Think Your Home Shows Well??? OK Reators, you just landed that new listing! House shows well, or so you think? A few small things can make a huge difference in making that house really "POP" and give the buyer that feeling of 'Wanting It'. We at Pocono Mountain Lakes Realty are now offering our sellers a complete refund of their consultation fee if they consult with Valerie Sagheddu, owner and artistic operator of Apostle Art, a Complete Home Staging and Design Service Company right here in the Great Northeast PA and Pocono Mountains area. Above are a few of the before and after pics of just the little things she picks up on. The homeowner actually had most of the items around her house. She just needed the guidance on where to place things and what colors to use etc... Check them out and check Valerie out at http://www.apostleart.com/! Pocono Home Buyer Looking for a Deal? Everyone is always looking for a deal. Doesn't matter what it is just so long as it is a DEAL! With the declining home values which coincide rather systematically with the rising unemployment Pocono Home Buyers and Investors are even more The Bargain Hunters. 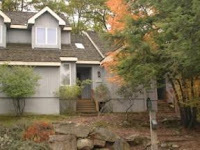 Well when I get a heads up from my Real Estate Peeps, in this case Heather Rickert, and she is giving me a heads up on a price reduction on a nice little cabin in Arrowhead Lakes I felt compelled to post this home here on my Blog. Let me run down a few of the details: 3 Bedrooms, 2 Bathrooms, Large Front Deck, Adirondack Siding and Backing to a large greenbelt. Don't get me wrong now, this home does need a little updating but it is also being reduced down to $93,000 and the owner is looking for offers NOW! Check it Out For Yourself Here! Well with Easter right around the corner I am sure that the Easter Bunny will be bringing Great Pocono Deals to all the good little boys and girls this year. Whether your Easter Wish list includes a small cabin getaway in gorgeous Arrowhead Lakes or a magnificent New Home accented with stone and cedar and Backed up to 21,000 Acres of Bradys Lake State Gamelands, we have the inventory and are in serious contract talks with Mr Bunny on your behalf. The result is Great Deals for YOU! Maybe you were especially good this year and Santa overlooked that fine behavior!! You might be eligible for a practically Brand New Country Cape on 3 Acres with 5 Bedrooms, 3 Car Garage and just under 3,000 sq ft of living space. I think that all the deals are right there in front of you this Easter and all you need is for Pocono Mountain Lakes Realty to steer you to the GRAND EASTER EGG HUNT!! !Look no further than this page. Stop by at the top of this Blog to say hi or better yet call us in person. Our Links and Phone Numbers are at the Left of This Blog! We will find you your Easter Special! Check out all of our links. Whether you are looking to Book a Vacation, Search The Pocono MLS or Just Want More Information on our Many Lake Communities, you can find everything right here on this blog, your blog, Rick's Pocono Blog!